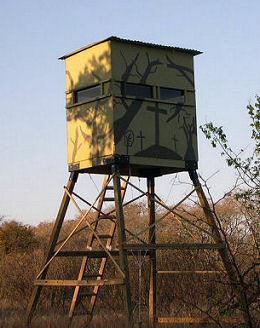 Another advantage to the tower hunting blind, like the one pictured and that can be built with the EZ Deer Blind Kit found on this website, is the fact that it gets the hunter’s scent above the animal making him less detectable to his prey. With 8’ treated 4”x4” posts for legs, the windows of the blind are at approximately 12’ high. This helps blow the hunter’s scent over the heads of most game animals. The advantages of a homemade hunting blind are many. It’s cheaper than a prefabricated blind you buy already assembled. You can easily customize it with shelves, carpet, etc… You can choose the paint color scheme to camouflage it into its surroundings. You can stay warm and hunt even on the coldest days by cranking up a small portable propane heater. This allows you to hunt longer and the longer you’re there, the greater the chance of an encounter with game. 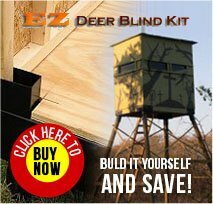 Other than those already mentioned, there are many other benefits to using one of our EZ Deer Blind Kits. The cost of the completed blind is unbeatable when comparing other tower blinds of similar quality. The powder-coated steel brackets have sleeves that allow you to easily slide lumber in. Angled 4”x4” sleeves for the legs take all the guesswork out of how to attach your box blind to a tower. Holes are pre-drilled for lag screws which makes for easy assembly. The plans that come with the kit are easy to follow and no special tools are required. Modifying the 4’x6’ plans to build a 4’x4’ or 4’x8’ is easy. Probably one of the best and most unique features of this blind is that it is completely portable. Build the box in your garage or driveway, paint it and let it dry, then disassemble it with just a few screws. You’ll end up with a floor panel, a roof panel and 4 wall panels in addition to your 4 legs and ladder. You can then stack all sections and parts into a regular short bed pickup, use ratchet straps to secure the load, then deliver right to your hunting site. Reassembly onsite is a simple matter and you didn’t have to bounce your complete tower blind across the pasture on a flatbed trailer loosening everything up. Be sure to anchor your blind securely to the ground. Excessive wind will blow over an unsecured blind and your beautiful new blind will be destroyed. You may purchase your anchor kit here. Now, rather than a shaky, noisy blind that rattles every time you shift your weight, you’ve got a rock solid blind to hunt from. Please let us know if you have any questions, and good hunting!